The CEOs of some of the world's biggest tech companies descended on the White House Monday -- along with a few people who aren't yet household names. One of those is Zachary Bookman, CEO of OpenGov. Launched in 2012, OpenGov focuses on helping state and local governments streamline their systems. Think opening up the budget process, setting trackable goals and being more transparent with constituents. The state of Ohio, which used OpenGov to drill down on local spending, went from #46 in financial transparency to #1, according to the U.S. Public Interest Research Group. Meanwhile an official in Ivins, Utah (population 8,000) was able to cut his budgeting time in half using OpenGov. His experience made Bookman a perfect fit for Monday's meetings, which were geared toward modernizing the federal government. "State and local governments are meant to be a laboratory of democracy," he said. "We're able to ... pave the way." Some have criticized tech CEOs for meeting with Trump, especially after his controversial travel bans and decision to pull out of the Paris climate agreement. But to Bookman, the meeting at the White House is apolitical. "I tell prospective customers, 'Look, you do the politics, we do the technology,'" Bookman said. It's borne out in OpenGov's customers -- 1,500 state and local governments that fall squarely on both sides of the aisle. Customers include the state of California all the way down to "tiny towns and counties in Texas that you've never heard of," Bookman said. Monday's meeting was set up as a series of working groups, covering everything from cybersecurity to cloud computing to the H-1B visa program. Bookman said he expected to weigh in on issues "like how to bring dashboards and analytics to federal government so we can run a data-based and evidence-based system" -- something he's well acquainted with from OpenGov. He stressed that it's not only about the technology, it's also about getting a workforce on board with the new tools. Recruiting and retraining federal workers was also on the docket Monday, with the White House noting that there are 113,000 federal employees who are IT workers. Procurement is a major pain point for cutting through bureaucratic red tape and modernizing the government's IT. It's also an area that Bookman expected to be able to weigh in with some serious firsthand knowledge. "Sales conversations go something like, 'I love it, I need it, let's get started,'" he said. "Then it's like, 'How do we buy that?' There are so many laws and regulations -- it can turn into a multi-month labyrinth that can kill the deals." 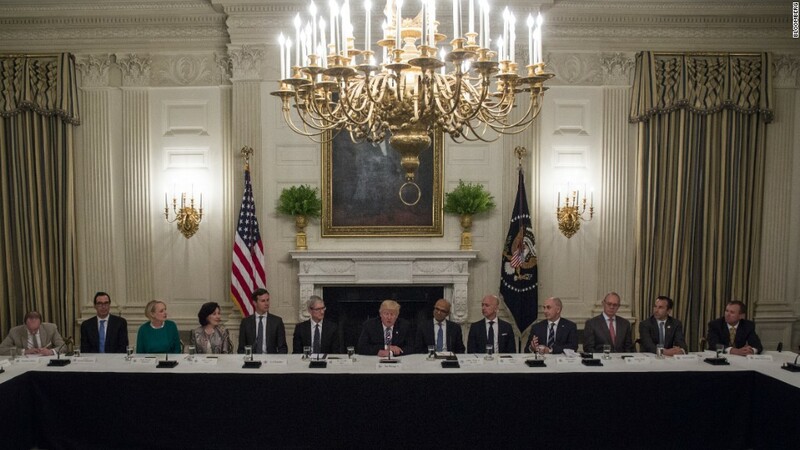 There were 17 other tech CEOs at Monday's meeting with Trump, including heavyweights like Apple CEO Tim Cook, Amazon CEO Jeff Bezos and Microsoft CEO Satya Nadella. Bookman said it was an "honor" to be there representing state and local governments. "It's important to not just hear from tech titans but from folks who are growing rapidly and in the trenches," Bookman said. "It's happening in Silicon Valley but also in all the Silicon Alleys and Beaches with small groups of engineers who are rethinking old processes and disrupting markets."